Tidal waves, which displace thousands of residents on the coastal part of the Volta Region annually, may be a thing of the past if government completes the sea defence project in the area. 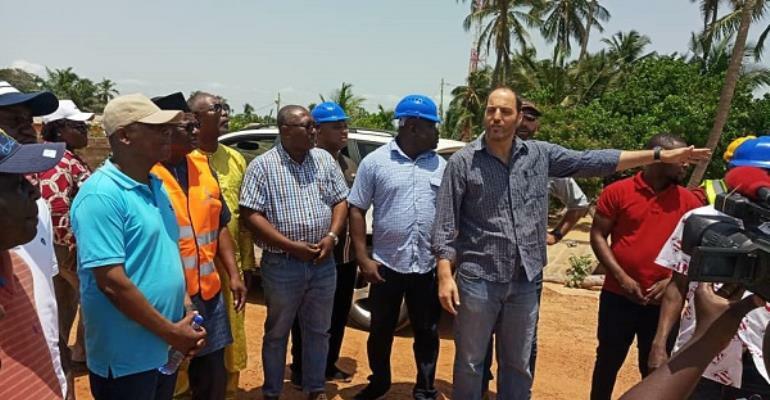 After government had spent US$85 million at Keta and US$41 million at Dzita in the Volta Region to construct sea defence structures, tidal waves still threaten the livelihood and existence of residents along the Blekusu to Aflao Coast. Last year, at least 1,500 residents at Keta and Ketu South municipalities, particularly Blekusu, were displaced with over 242 houses and properties submerged and destroyed. A good number of boats and nets of the fishers in the area were completely destroyed too. For this reason, the Ketu South Municipal Chief Executive has pleaded with government to consider extending the Blekusu to Adina Sea Defence project to reach Aflao in terms of completely dealing with the tidal waves crises in the area. According to Mr. Elliot Edem Agbenorwu, if the project is extended, it will relieve thousands of lives, sustain many businesses and allow the assembly to focus on other developmental projects. He made the appeal when the Parliamentary Committee for Works and Housing inspected the 42-kilometre Blekusu to Adina Sea Defence project which was awarded to Amandi Holdings in early 2016 by the erstwhile NDC government. The project which stalled in July 2016 was revived by the governing NPP government in May 2017. The Executive Director for Amandi Holdings, Mr. Dror Tahar, told the committee that the project which cost $40 million is about 85 per cent complete, with 100 acres of land claimed out of 420,000sqm, representing 103 acres marked for the project. The Dufia for Blekusu Togbui Agbali III, who was happy with the project, lamented the extensive erosion posed by the groins at the end of the phase one of the project to the neighbouring communities from Adina to Afloa. He also noted that some victims of the tidal waves are stranded, with some relocating to other nearby communities, including Togo and Benin. He therefore appealed to government to come to the aid of the affected persons. Chairman of the Committee Nana Amoakoh and his team were satisfied with the project so far, but were worried that the extensive erosion on the neighbouring communities from Adina towards Aflao was dangerous especially “as the June-July rains are approaching”. He gave an assurance that the committee would report to Parliament and recommend for phase two to commence to save the situation. Vice Chairman Kweku Asante-Boateng was hopeful that phase two of the project is awarded before the completion of the phase one in July 2019 to cut cost on mobilizing Amandi holdings to site again.